The Calgary Padel Academy is in full swing for 2019. The Stars of the Future program is headed by Bill and Andres Stamile, the only certified padel instructors in Canada. Their track record proves that they are men who know how to motivate kids and how to develop then into the stars of the future. In 2009, their juniors, playing under the Canadian flag, achieved a third place finish at the World Junior Padel Championships. Our message to parents and their kids is that with some commitment, and also lots of laughs along the way, it is possible to some day in the near future wear the Canadian colors and play padel for your country. We've done it before, we can do it again. As mandated by our By-Laws, The Calgary Padel Club is determined to provide programs where we introduce children to padel, the program is called "STARS of the FUTURE". That's what we love to do! Padel is a fantastic game for kids, not only gets them to learn a new sport, get in shape, socialize, but also helps them improve their self esteem. Because padel it's easier to learn than most other sports, kids can achieve improvements quickly, without all the frustrations of leaning more difficult sports like tennis for example. Email us at CPC and get your kids started now. They may well become Canada's "Stars of the Future". 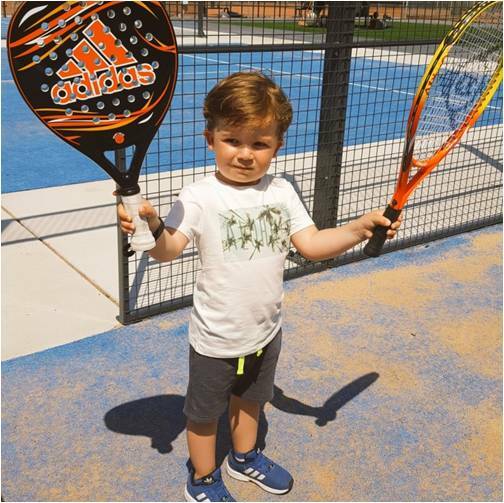 It’s not only adults who have fun by playing Padel, but it also gets the kids excited, no matter their age. The simplicity of this sport makes it extremely attractive for everyone. The main focus and driver is the motivation and the fun factor of this exciting sport. Playing Padel also helps them to fight obesity and promote healthy living habits. Experts recommend that children should exercise a group sport and another sport with a more individual character. Padel and tennis meet the criteria and are very well suited for this purpose. Padel is easier to play, and appeal to a wider audience around the globe. Join the "STARS of the FUTURE" program.